Place your sifter over your beaten eggs and sift in your 2 cups flour, 4 tsp baking powder and 1/4 tsp salt. Add the bran that's left behind in your sifter. Pour in 1 3/4 cups milk, 1/2 cup olive oil, 1/2 tsp vanilla and 1 Tbsp honey. Whisk the mixture together until smooth. In a small bowl, Mix together 1 cup blueberries with 1 tsp whole wheat flour. Use a spatula to fold in the frozen blueberries. Pour your batter into your preheated waffle almost to the edges. 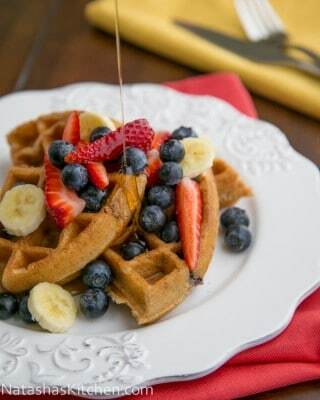 Serve waffles right away or let them rest on a wire rack. Don't stack them while they are warm or they will become squishy.